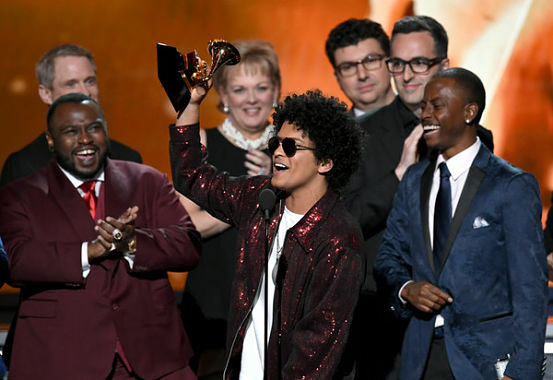 OH, WHAT A NIGHT: Bruno Mars accepting one of his awards during Sunday's live telecast. 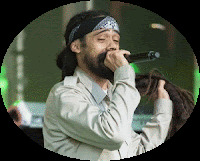 DAMIAN Marley is gaining on his brothers fast. The youngest of the Marley siblings (aka Junior Gong) won the Grammy for Best Reggae Album on Sunday, bringing his tally so far to four. While Ziggy has nabbed six career wins already, Stephen still holds the lead with eight trophies (for albums and production credits on other Marley projects). Junior Gong’s Stony Hill, released on his birthday last July, found favour with the Grammy voters, who gave him the nod over first-time contender Chronixx (Chronology), past winners Morgan Heritage (Avrakadabra) and strong candidates J. Boog and Common Kings (Lost In Paradise). In 2001, Junior Gong won his first Reggae Grammy for Half-Way Tree. Four years later, Welcome to Jamrock, considered an instant classic, copped both the reggae trophy and the award for Best Urban/Alternative Performance for the album’s title track and lead-off single. Meanwhile, Sunday’s action-packed ceremony marked the 60th anniversary of the biggest night in music, honouring outstanding achievement in the past year. Pop superstar Bruno Mars was the toast of the awards, bagging six wins, which also represented a sweep of all the major awards: Album of the Year (for 24K Magic), Record of the Year (“24K Magic” and Song of the Year (“That’s What I Like”). Broadcast live from Madison Square Garden, the star-studded show saw performances by Rihanna, Kesha, Kendrick Lamar and many more.